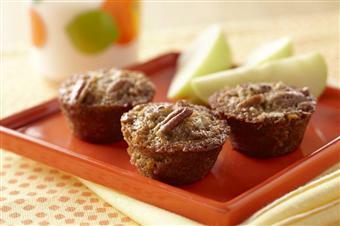 Make these cute little mini muffins for a special breakfast treat. Since this recipe only makes 12 ( that’s like 4 regular sized muffins) you can indulge and still feel good about it. Preheat the oven to 350°F. Place 12 mini muffin papers in a 12 mini muffin cup pan. There are some really cute designs out there. Go find some fun ones. You can also grease and flour the pan, but why? In a small sized bowl, stir together the brown sugar, flour and 1/2 cup of the pecans. You could also use a larger sized measuring cup and skip the bowl. In the bowl of an electric mixer ( or use a hand held one if you don’t have the big one) beat the corn syrup, butter and eggs until smooth. Stir the corn syrup mixture into the dry ingredients until mixed well. Spoon the batter into the prepared muffin cups. If you use a small cookie scoop, it’s a breeze. Otherwise use a 1/8 cup mesure if you have one or a tablespoon. Muffin wells should be about 3/4 full. Sprinkle the tops with 2 tablespoons pecans. Take out and allow to cool for 5 to 10 minutes. Then pop out of the pan and cool completely on wire racks. If you went the grease and flour method, make sure to run a thin spatula around the sides to release them. Do you have a banana breast muffin recipe? Hi there! Two questions- what can I sub for the light corn syrup, light molasses, or agave? What suggestions do you have? Can I use maple syrup by chance? What other things can I sub? Second question is if I do use reg molasses, not light (I might be able to get some from a relative) – would that change how much I use? This recipe look delicious but I just don’t use any of those items and I do not want to buy them just for one recipe. Thx so much! You can definitely use maple syrup if you want or honey too for that matter. As long as you replace the liquid sugar with another liquid sugar the recipe will work just fine. Maple syrup will give it a nice flavor too!